Android.InfectionAds.1 is a Trojan running on Android devices. 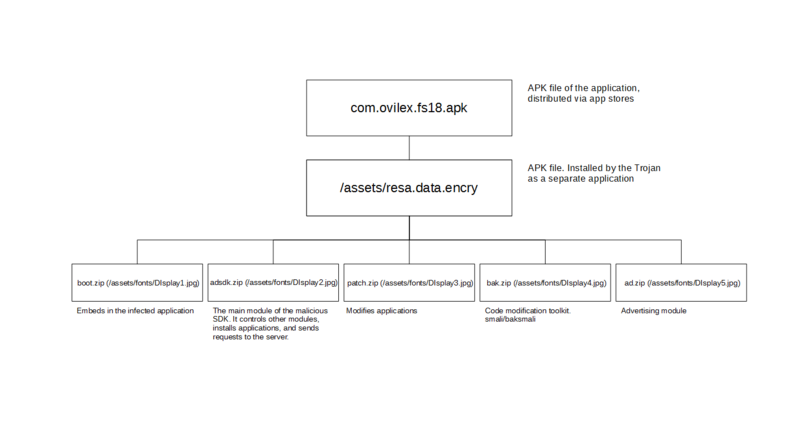 It exploits several critical vulnerabilities to infect APK files and independently install other applications. In addition, Android.InfectionAds.1 displays ads. The attackers embed the Trojan into the initially benign software and then distribute it via third-party stores and software collections for Android. The following description is based on the analysis of its modification (dd82f232cf647463720d54b44917a218a6ddfefa). ad.zip — an adware module. The Trojan launches when the startSDKInit(Application) method of the com.android.support.multidex.MultiDexApplication class is called; it is usually called in the Application class of Android applications. In some versions of Android.InfectionAds.1, this method is called using reflection. The Trojan decrypts the /assets/resa.data.encry archive, stored in its file share, extracts the modules adsdk.zip (/assets/DIsplay2.jpg) and patch.zip (/assets/DIsplay3.jpg) to load them into RAM. infects the applications, specified by the command and control server (if it fails to connect to the server, it infects programs from the default list). Android.InfectionAds.1 is able to install applications independently from user. For that, the Trojan uses the critical vulnerability of Android, CVE-2017-13315, which falls under the EvilParcel class. It has been implemented using the Proof of Concept code, created by information security researchers. Android.InfectionAds.1 creates a specific Bundle object to exploit the EvilParcel vulnerability and enhance its privileges. Within the object, it creates an Intent that runs the activity of the package manager. 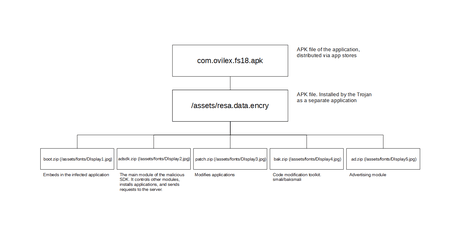 The Trojan sends specific parameters to this activity, including the path to the installed application. The package manager processes the Trojan’s Intent as a system Intent and installs the program. Android.InfectionAds.1 is able to infect programs installed on Android devices. To do this, the Trojan uses the vulnerability CVE-2017-13156 (Janus). It helps the Trojan add its components in the target APK files without changing their digital signature. Then, using the EvilParcel vulnerability, Android.InfectionAds.1 installs infected applications as their own updates, replacing the originals. The programs remain operable, but when they are launched, the Trojan is the first to receive control. The executable file classes.dex from the Trojan module boot.zip contains Application classes matching the class names of the compromised applications. Because of that, upon launch of the infected programs, the Trojan class Application is called instead of the original one. To run the modules stored in the malware.zip archive, Android.InfectionAds.1 uses the modified library com.android.support.multidex. Instead of the original fle classes.dex of the infected application, its copy from the malware.zip archive is used. The server commands may contain the parameter "is_patchself": true. If it is present, the Trojan attempts to apply a patch to the application code, into which it is embedded. To do this, it uses the backsmali/smali utilities in the bak.zip module. After downloading the files, the Trojan automatically installs them, exploiting the vulnerability CVE-2017-13315. When an infected application requests parameters for displaying an advertisement, the APIPulic.AdLoader_Builder_init(Object, Object) method responds with the Trojan's advertising ID. Then the original advertising identifier is replaced by the one from the Trojan. As a result, all profits from displaying banners are received by virus writers, not the developers of infected programs. Besides, the Trojan interferes with the work of other advertising platforms—for example, Mopub.